This honey bee has a varroa mite on her thorax (photo by Derek Allnutt). Varroa mites can carry viruses that enter the bee's body through puncture wounds. There are more than 20 honey bee viruses of which deformed wing virus is the most common. Untreated colonies will die within two years. It is really important to keep varroa mite levels under control. Here is a good strategy to reduce the use of pesticides in your apiary. Colony management has become more complicated since the arrival of new diseases and pests. Fifty years ago, there was little need for chemical intervention. Today the top four diseases and pests (Varroa mites, Tracheal mites, American foulbrood (AFB) and Nosema) require a different course of control for each species. Over time, it has become clear that synthetic chemical control is the least desirable option. 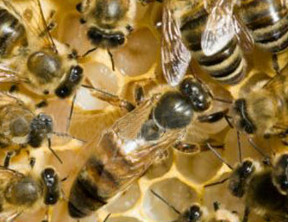 Concern about disease and pest resistance to the chemical treatment, potential for chemical residues in honey, the likelihood of environmental damage and growing consumer awareness of health issues related to pesticides and antibiotics, are good reasons to reduce the use of synthetic chemicals in apiary management. Beekeepers are seeking new ways of managing colonies using an Integrated Pest Management (IPM) strategy. IPM is not a new concept. It was developed in the 1950's in response to escalating disease and pest resistance to chemical control products. As chemical resistance increased, the quantity of chemicals needed for control increased, resulting in higher costs and greater environmental damage. alternating synthetic chemical control products that have a different mode of action. Feed and winterize colony in fall. Ensure colony has sufficient stores of honey and pollen. A two brood chamber colony ready for winter should weigh 120-180 lb. The great advantage of an IPM strategy is the economic benefit of only using chemical control when necessary. Reducing dependency on synthetic chemical controls not only lowers treatment costs but it has an overall positive effect by reducing the risk of resistance, prolonging the useful life of a chemical and reducing the impact of residues on the colony, the product, the consumer and the environment. Click here to view an IPM poster, Seasonal Management of Honey Bees prepared by Heather Clay, Canadian Honey Council, 2010.